Union Station by Joe Fiorito takes a look at the stories of the everyday people of Toronto. The author avoids telling the stories of those you see in the newspapers and magazines. In other words, the stories told by Fiorito are not about politicians or any 'Hollywoodesque' like stars. Instead, Fiorito tells the stories of the common people of Toronto. The book takes a look at the stories of the people who own the local corner store or restaurant, local homeless person, local seniors and others. These stories tell the trials and tribulations of everyday life that people are in Toronto are facing either on their own or with others. The stories include drug addiction, losing the local grocery store, prostitution, housing, and attaining health care. The book's concept of telling the stories of the average person is quite unique. No where else has one come accross the telling of the stories of average people in Toronto except in the newspaper. Even at that, the newspaper doesn't cover a lot about the average person except for the death notices. This is where Union Station is unique. Telling the stories of the average person means the reader can readily identify with the stories being told. This book provides just that connection on a personal level. It was the first book I tried blogging about after reading each chapter. Each chapter got me thinking about different issues Toronto were dealing with. The issues of how to make it easier for immigrants to integrate themselves into Canadian society were most interesting. These issues that Fiorito tells first hand stories about immigrants in Canadian society include attaining health care and learning English. The plight of the immigrant was just one topic that found my mind wandering while blogging. There were lots of others of course. Fiorito writes the book in a style that allows the reader to believe it is them who is having a conversation with the person's story that is being told. 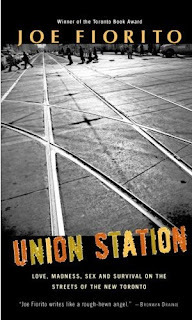 While reading a chapter from Union Station the reader feels as if they and the person telling the story are sitting in a Tim Horton's having a conversation over coffee. While reading the chapter, the reader might feel like nodding their head in understanding what the Fiorito is attempting to convey. It is this style of telling the stories of the common person that makes the book so accessible to the average reader. Stories of the everyday person can be hard to tell. Do you attempt to make them interesting to the reader by embellishing the story a little bit? Or does the author tell the story like it is? Fiorito tells the story 'like it is' by making you feel like you are there experiencing it yourself. Also the Fiorito wants you to start thinking right after finishing reading the chapter. Fiorito's writing style and the fact this book is about interesting events that occurred to the person you might run into on the corner is what makes this book so worthwhile to read!